Among my dreams were to help decorate a float for the Tournament of Roses Parade and to have a front-row seat at the parade itself. 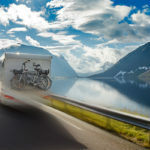 By January 2, 2012, I had completed both of these dreams and they were one of the highlights of our RV life. Before I describe our specific experience of helping to decorate a float for the City of Glendale, California, I’ll give you a bit of float-building background. Shortly after each parade has ended, the float builders present their designs to the Tournament of Roses for approval for next year’s parade. This process ensures that each design is consistent with the chosen theme and that there aren’t too many similar floats in one parade. Although there are more than one float design company, most of the floats that are professionally designed are owned by the Phoenix Decorating Company. They build the floats in two buildings in Pasadena, the Rosemont Pavilion and the Rose Palace. We were working in the Rose Palace, which is anything but a palace. It’s a large warehouse that houses nine or 10 floats that are being worked on year-round. 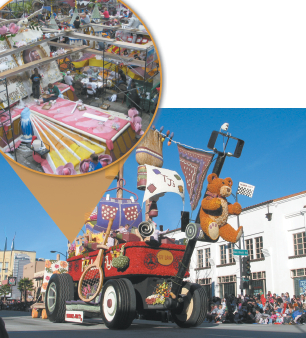 The Rose Parade committee has approximately 950 volunteers who help with the floats and the parade. For example, one committee runs fire drills once a month to see how quickly the floats can be evacuated from the building and to be sure passengers in the float can escape safely. While the floats are out for the fire drills, they are tested for road safety, and the float is checked for street worthiness. On the night before the parade, floats are brought to the street, and someone guards each one all night. During the parade, the volunteers also walk with each float to be a liaison in case there are problems. Every visible inch of every float must be covered with flowers or some other organic material. The organic material cannot be dyed or colored in any way but can be cut, split, smashed or pureed in a blender. Some of the materials used are corn husks, dried flowers, split peas, seeds, cranberries, pine boughs, rice, dried beans, nuts, grasses, dried fruit, coconut, spices, barks, artichokes and mosses. 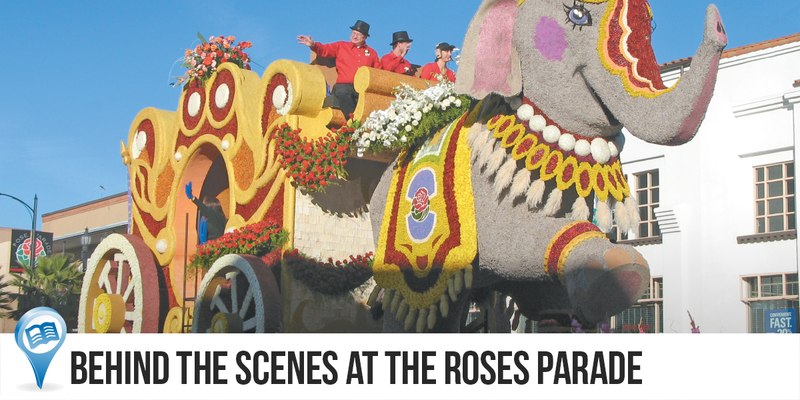 Flowers come from all over the world, and most are grown specifically for the Rose Parade. Most floats use as many flowers as a florist would normally sell in five years. Underneath each design is a foundation of rubber, hydraulics and steel. 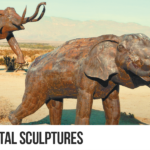 Sculptures are created by welding thousands of pieces of pencil steel. Aluminum screening and chicken wire are wrapped around the sculpture. Plastic foam is then sprayed on. For detail work, Styrofoam can be added, which then can be sawed, shaped and glued. After this skin is added, the float is painted to color-code each area so decorators will know what color to use. Designers must calculate how much weight the float needs to carry. If it rains, the float can absorb up to three times its weight in water. For three Saturdays in December, much of the dried materials are glued on. Flowering begins the day after Christmas with thousands of volunteers showing up from all over the country. It’s a nonstop buzz of activity until the last flower is placed on the float on the day before the parade. The hardier flowers, like mums, are glued on first. The more delicate flowers are usually held in individual vials of water and put on last. Adjacent to the Rose Palace is a huge tent that contains all the live flowers and other plants. Teams of workers stand at tables, stripping the thorns and leaves off the roses and other flowers, cutting the stems to a proper size and putting each flower into a vial of water. The vials are then pushed into a Styrofoam tray to be kept until the float is ready for them. For this parade, we were in our truck camper, but rigs of all sizes and types were there. While working on the floats, two couples with larger rigs parked on the street a short way from the Rose Palace. Because we were small, for $5 we parked in the parking lot across the street, and as long we didn’t leave, we didn’t have to pay again. Besides Larry, my husband, and me, Wendy Hall #49625 and Don and Glenda Wicks #107548 worked on the City of Glendale float that was a circus elephant pulling a circus wagon. Gretchen Mattison #96264 works as a florist for the Phoenix Company, so she created flower arrangements for our float and for other floats as well. Most of the volunteers working on our float were high school students who received community service credit for their hours. The students loved to be high on the scaffolding, which was fine with me. That meant I didn’t have to! We cut dried flower petals off the stems. The petals were then put into a blender to make a fine powder that was sprinkled onto a glued surface. We also cut stems off small mums and put the flowers upside down in a box. Dabs of glue were placed on each one so someone could stick them to the glued surface of the float. Another task was gluing corn husk squares to look like shingles on the front, back and floor of the circus wagon. 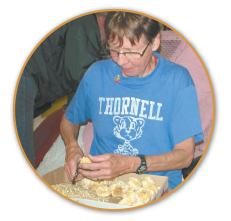 Some high school students had previously cut the corn husks into three- and four-inch squares. Other volunteers put glue on the squares, and then we stuck them to the wagon. • Gluing split peas one at a time using tweezers. • Cutting carnation petals off the stems and gluing one petal at a time, overlapping each other. • Sprinkling fine powders or seeds onto the glue that had been brushed on an intricate design. • Pulling gray ming moss off the stems to glue onto the elephant to create his skin color. • Gluing cranberries onto the ankles and blanket. One section of the warehouse was just the glue table. When we needed more glue, we went to the table and they would pour more into our bucket. Once the glue got on fingers, it was hard to get off, so people spent a lot of time at the sinks. Peeling it off after it dried worked best. We dressed warmly and in layers. The building was not heated and can be quite chilly in the morning but warms up as the day progresses. We wore old clothing and sturdy closed-toed shoes. While we were working on the floats, we could see people on an upper walk who paid $10 to see the decoration process. They could also walk on a designated path on the main floor with a guide who explained what was happening. Once the top of the float was done, the scaffolding was removed in a few minutes. After laying greenery to cover the lower part of the float, the vials of flowers were pushed into place to completely cover the base. We worked three days and it was tiring, tedious work but exciting to be a part of the process. To ensure ourselves a good parade parking spot, at 5:30 a.m. three mornings before the parade, those of us working on the float moved our rigs to a side street along Colorado Boulevard where the parade would be. You can’t park on all of the side streets, but refer to the visitor handbook mentioned below to be sure you are parked legally. Normal parking rules are suspended between Christmas and New Year’s, but to be sure you are in compliance, visit www.pasadenacal.com/tournament-of-roses/visitor-hotline to download the Visitor Hotline Handbook. It has information on the Rose Parade, bandfest, equestrian shows, grandstand rules, camping on the street, the Rose Bowl Game, RV parks, RV dumping and propane. After parking our rig, we walked back to the Rose Palace to continue our decorating job. When we got back to our rig that night, there was a note on our truck asking us to call the police so volunteers could stop by and register us. When RVs are parked on the first block of streets on either side of Colorado Boulevard, the police give owners a “Welcome to Pasadena” bag with maps and booklets. They also go over “Parade Watch” guidelines and gave us a decal for our truck window to show that we were registered. For the parade, some people pay big money for bleacher seats with no backrests and cannot have backpacks or coolers with them. We paid with our time and lack of sleep to have even better seats! Usually the parade is on New Year’s Day, but when the parade tradition started, they agreed to never have it on Sunday, so in 2012 the parade was Monday, January 2. On Sunday morning, people started putting their chairs on the sidewalk next to the stores. At noon we could move our chairs to the curb. Some used colored tape to “mark their territory” by forming a rectangle the size they needed and then settled in for the long haul. They had air mattresses, sleeping bags, games, grills, coolers and food for spending the night. People even brought firewood to have campfires in metal containers. Propane tanks up to five gallons in size are allowed. On the parade route, there is a blue line painted in the street a few feet from the curb. At 11:00 p.m. we could move our chairs to the blue line for a front-row seat. However, someone had to stay with the chairs all night or the police would take them away. The rule book says one person in each chair, but a policeman told me the rule-of-thumb is one person for every five chairs on the street. We had borrowed sleeping bags and air mattresses. In spite of all the noise, I actually slept a couple of hours on the street. Some RVers had made friends with those nearby and asked them to watch their chairs while they slept in their rigs. That may work if you find trustworthy people. There were 11 Escapees in the area where we were, so we took turns staying with the chairs. The parade started right at 8:00 a.m., but we were over a mile away, so it got to us about 8:30. We were ready! We were parked on the south side of the route because that’s the side the television cameras are on, so the floats have their best side showing. For example, we were delighted to see and hear Kenny G playing on a float on our side of the street. Also, if it’s hot, which it was, the shade on the south side is a welcome relief. However, if it’s cooler like it usually is, the sun on the north side feels wonderful. Since we were on the street and could not hear the television announcers, we bought the official program book for $10 so we could read about the floats, bands and equestrian units as they came by. After the parade, the floats are on display for a few days at the end of the parade route, and for $10 you can admire them even more closely. You may have seen the Rose Parade on television, but seeing those floats up close is absolutely breathtaking. This experience was enhanced by knowing firsthand what went into creating these beautiful floats. There is a lot to do in Pasadena the week before the parade. There is the Bandfest where all the bands that will be in the parade perform, as well as a venue to see the equestrian units perform. Besides the activities related to the Rose Parade and football game, there are two museums worth visiting: the Norton Simon Museum and the Huntington Library, Arts Collections and Botanical Gardens. To volunteer to decorate floats, go to phxdeco.com. Sign up for one building or the other and for whatever shifts you’d like. Each shift is eight hours. Volunteers must be at least 13 years old. If you do not want a do-it-yourself Rose Parade experience, watch for information about upcoming Rose Parade Head Out Program (HOP) events in future issues of Escapees magazine.